Lucas Paqueta has touched down in Italy as he prepares to complete his move to AC Milan to provide the Rossoneri with a major mid-season boost. As noted by Sky Sport Italia, the 21-year-old is expected to join the Italian giants in a €35m deal after shining for Flamengo. He bagged 10 goals and four assists in 39 appearances this past season in Brazil, but he now looks set to begin a new chapter in his career in Serie A. Given the current injury crisis that has hit Gennaro Gattuso, with Lucas Biglia and Giacomo Bonaventura being ruled out with long-term injury problems, adding Paqueta as a midfield reinforcement in January will be welcome news for the Italian tactician. 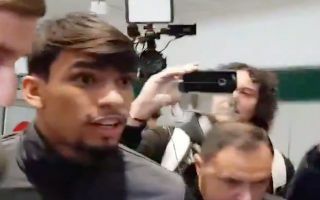 As seen in the video below, Paqueta has now arrived in Italy, and his first words to the media briefly were: “I’m very happy to be at AC Milan, I chose the Rossoneri because of their history,” as reported by Calciomercato. Time will tell if he is able to settle and prove his worth at the San Siro, but he’s certainly shown enough promise and potential to this point for club and country to suggest that he could be an exciting and important addition for Milan moving forward.